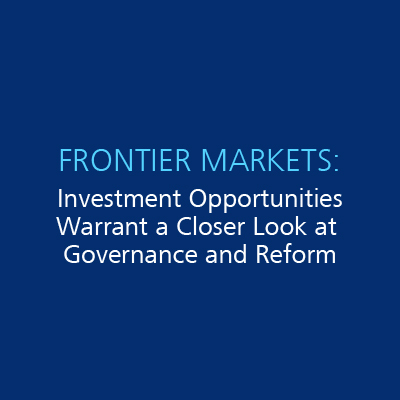 Frontier markets represent a small, fast-growing proportion of global asset allocations. Over the past two years, ISS has increased its coverage of annual meetings in the frontier markets in Asia (Pakistan, Vietnam, Sri Lanka, and Bangladesh) by over 50 percent. The aggregate number of clients attached to these meetings increased at a much greater rate. In the MENA region, the number of companies held in client portfolios increased over the past two years by approximately 28 percent, with the greatest coverage growth seen in Kuwait and Jordan. The data clearly shows a growing universe of companies deemed suitable for investment, as well as an increase in the number of investors holding each frontier market company.